And called You His beloved Son. Enter His gates with thanksgiving, and His courts with praise! Sunday, April 7 we were blessed and honored to have His Eminence Archbishop Michael's presence at our Mission Vesper Service. The Resurrection of our Lord and Savior Jesus Christ is on April 31. As mentioned by Fr. Igor in last month's message, "Just remember, that while trying to get our attention, Christ will not force His way into our life. It is our job, we must open the door and let Him in. So let us ask God to help us to re-discover Him deep in our hearts, deep in our souls, so that we can spiritually prepare for the joyous celebration of His Holy Resurrection!" Happy Birthday to Maxim who will be celebrating his birthday on April 7. May God grant Maxim and all those celebrating their birthday in April Many Years! Plan to attend as many services as you are able and light your candle before Christ. 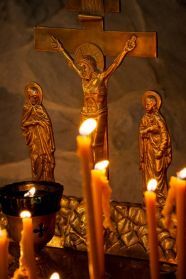 Father Igor's March message concerning Lent and the services available can be read here in its entirety. Shown here is Genevieve Bobenko who will be celebrating her birthday on March 22. Happy Birthday and Many Years to Genevieve and all those celebrating in March.